The problem is not sins but sin, that declaration of independence—whether stated viciously or politely—which says, "Yes, I do want to be like God, calling my own shots." Dale Ralph Davis, Such a Great Salvation. Moses led the Israelites out of Egypt c. 1450 BC. Saul began his reign c. 1050 BC. Thus I believe end of the 12th and 13th Egyptian dynasty to be out by ~300 years and the beginning of the the 18th dynasty out by ~500 years. Hammurabi is dated variously to 1700, 1800 and 2000 BC. Shorting this by 300 to 500 years gives a range of 1200 to 1700 BC. Thus he could be contemporary to or even post-date Moses. It is more complicated in that the 6th Egyptian dynasty may be contemporary with the 12th and 13th, and the assigned Babylonian dates may not completely rely on Egyptian synchronisms (as per my assumption). At the time when Amraphel was king of Shinar, Arioch king of Ellasar, Kedorlaomer king of Elam and Tidal king of Goyim, these kings went to war against Bera king of Sodom, Birsha king of Gomorrah, Shinab king of Admah, Shemeber king of Zeboyim, and the king of Bela (that is, Zoar). All these latter kings joined forces in the Valley of Siddim (that is, the Dead Sea Valley). For twelve years they had been subject to Kedorlaomer, but in the thirteenth year they rebelled. That is mrp-l and mrp. The same name other than the final el, Hebrew for God. A designation he likely used as Hammurabi was deified. Abraham's battle with the kings occurred between his departure from Haran and the birth of Ishmael. 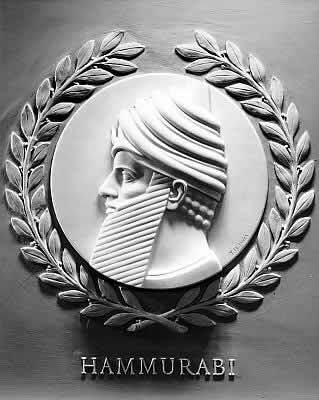 Thus the time of Hammurabi is c. 1850 BC. I have mixed feelings about the inequality argument. I think the issues are a slightly more complex than often argued, but in general I do not find it a problem. This puts me at odds with many of my fellow Christians, or at least the more vocal ones. Absolute wealth has its temptations, but I don't see inequality per se as a specific problem. We have inequality in many other areas of life: sporting, music, literary, and numeracy capabilities. Not many people argue against this natural inequality and most would just seek to optimise each individual's ability. Money has some differences to this but also some similarities. Now I don't necessarily have sympathies with the extremely wealthy. I am not sympathetic to the legal protections for bankers or government bailouts. I think money can be made immorally. However I don't object to people having money just because they have a lot of it. Nevertheless, I am concerned about the poor; especially the oppressed poor. Perhaps I could be more concerned in my actions, but in general I support just laws which I think protect the poor from oppression and, in the long term, rise them out of poverty. But inequality is not the issue. The Guardian quotes an Oxfam report. The share of the world’s wealth owned by the best-off 1% has increased from 44% in 2009 to 48% in 2014, while the least well-off 80% currently own just 5.5%. But what does this mean and why is it so? Here is the comparison of rich and poor. Now there is some difficulty using this timeframe. It is during the time of the global financial crisis which may skew results based on fluctuations of various currencies. And it is probably too short, a longer timeframe would be preferable. Even so, the benefit of this graph is that it shows absolute values. According to this data: in 2000 the poorest 50% had $400 billion, in 2002 $700 billion, in 2005 $1300 billion and by 2014 $1800 billion. So if we completely ignore the wealthy we note that the wealth of the poor has grown by billions in the last decade. Even taking into account the rising population, the poorest 50% are significantly increasing their wealth. This is a good outcome. Now this seems more preferable to me than the richest 80 people increasing their wealth, but that they did so does not bother me. And it is not obvious based on this graph (alone) that the increased wealth of the rich was detrimental to the poor. Now perhaps it was detrimental, especially when politicians offered to bale out massive companies at the cost to middle class taxpayers, though that probably hits the richest 50% in developed countries. But what if wealth grows like that? What if, as productivity increases through the use of capital, the labourers and the owners of the capital both increase their wealth? If you had the opportunity to increase the income of the poor from $2 a day to $5 a day by entrepreneurs who also doubled their income from $10 million a year would you be happy? Or would you rather remove income from the wealthy and give the poor an extra $1 a day knowing that the following year their income would be back down to $2 a day? Now if men make money from fraud or theft then justice demands that this is taken from them and given to their victims. And those with money should help the poor: both direct giving when necessary, or providing work, opportunity, or capital. But the cry of "inequality" without consideration as to the why can just reflect a politics of envy. But all this shows only, that these good people [French Communists] are not the best Christians, although they style themselves so; because if they were, they would know the bible better, and find that, if some few passages of the bible may be favourable to Communism, the general spirit of its doctrines is, nevertheless, totally opposed to it, as well as to every rational measure. Christians have predicted the end of the world for centuries, although such prediction has a bad wrap currently. Of course there are many failed predictions we can point to, as well as Jesus' admonitions telling us we cannot know when. Even Jesus didn't know! I think the idea that it is impossible to know is a little simplistic. And while many people falsely thought the end was nigh, there will be a generation around when Jesus returns. So can we know anything about the timing? And what did Jesus actually say? The second before his ascension. During the Olivet discourse Jesus prophesies concerning the destruction of the temple, the distress to come, and his return. It is his return which occasions the comments above. There will be signs in the sky at his return but people will be continuing their usual living: eating and drinking, marrying and giving in marriage; as in the days of Noah just before judgment. Jesus' comments are notable for 2 things here. Firstly he mentions the day and the hour which may indicate quite a specific time. While not necessarily as specific as a certain day—it could preclude prediction of the year—it does not necessarily mean that one cannot know the approximate time. Daniel gives quite an exact prophecy timewise but it was difficult to understand at the time and even now continues to evade many commentators. Jesus' words here have been used to dissuade prediction and disparage predictors but he may not be completely prohibiting prediction as such. Which brings us to the second notable issue. Jesus' comments expect men who live in the last days to recognise that they are. Right in the midst of describing his return and warning them that they cannot know the exact time Jesus gives the lesson of the fig tree. From the fig tree learn its lesson: as soon as its branch becomes tender and puts out its leaves, you know that summer is near. So also, when you see all these things, you know that he is near, at the very gates. Truly, I say to you, this generation will not pass away until all these things take place. Heaven and earth will pass away, but my words will not pass away. "When you see what I am describing" says Jesus, "know that my return is near." In fact Jesus' return will be during this generation. So why have so many people in previous generations been wrong about Jesus' return? It is my contention that there are several conditions given around the end of the world, both here, and in other books such as Daniel, Zechariah, Thessalonians and Revelation. Other generations may have noted aspects of the world that fit some features, but not all. The generation of Jesus' return needs to see all aspects fulfilled, or being fulfilled. Ironically, the failed predictions of previous naysayers may have steeled the last generation against warnings of the end of the world, thus proving Jesus' warning about the days of Noah. The warning in Acts does not detract from what I have said though it does need commenting on. Firstly, the nature of the kingdom of God was to be different from previous kingdoms of Israel, at least until Jesus' return. Secondly, the disciples concerning themselves with a coming earthly kingdom may have detracted them from Jesus' task which was discipling the world. Thirdly, this was given to the disciples of that time. Now while I think discipling the world applies to subsequent disciples including those of the final generation, this does not preclude the final generation knowing that they live at the time of the end. In summary, we cannot know the exact time and we should concern ourselves with discipling the world. This does not necessarily preclude knowing the approximate time. And even if we cannot know the approximate time ahead of time, those living in the generation of Jesus' return are expected to be aware that they are living in the last days. Further, they must not be complacent. The medicine of austerity always becomes worse than the disease of profligacy. I have heard it said at least once that if Christianity is true it should be able to stand against its critics. It should have good answers to those who find problems with it. Some also suggest that believers can and should read books antagonistic to the faith because if Christianity is true then our beliefs will stand. I happen to think that the basic concept behind these thoughts is valid. Truth refutes falsehood. Let God be true and every man a liar (Rom 3:4). If Christianity is the true worldview then all facts and experiences will be consistent with it. The problem with this position is that we are finite. So while a robust faith can take it on the nose, how robust is our faith? How well equipped is the average Christian to receive challenges to his beliefs? Faith is more than well-grounded correct knowledge. And I have no problem with those of a less intellectual disposition who are content to follow Christ as best they can without concern with to cognitive challenges. Nevertheless, there are challenges to one's faith in reading authors antagonistic to God. Falsehood can be very persuasive. Many struggle to distinguish dialectic from rhetoric; many lack adequate foundation and confidence in truth; and many struggle to identify the false presuppositions or interpretations clothed as facts. Therefore, spending significant time reading material inconsistent with Christianity is not helpful. This is not a matter of whether Christianity can weather the storms, it is whether you can. Don't assume you know more than you do or that you are stronger than you are. It is a battle. The war for your soul is real. Jesus said he sends us out as lambs amongst wolves (Luk 10:3). Wolves seek to destroy lambs and are successful in doing so. Sheep have no defense against predators and lambs are even more vulnerable. Consider this decision. Now I don't know where this guy was at prior to reading so many books on atheism but I think this sort of thinking is incredibly foolish. I was raised in a Christian Fundamentalist home my whole life. From one through 12th grade I was home schooled, and was taught everything through the Christian fundamentalist lense. After High school I attended a hyper fundamentalist place called Honor Academy. At Honor Academy I gained interest in philosophy and Christian apologetics and decided to dedicate my life to Christian apologetics. I am 23 now and since then I have read hundreds of Christian Apologetics books. I have read all of Lewis, all of Schaeffer, all of Peter Kreeft, all of Dr. Geisler's books, including his encyclopedia A-Z twice, and his Systematic Theology twice, I have read Plantinga, McDowell, Craig, Ravi, Moreland, Holding, Swinburne, N.T Wright, Paul Copan Etc. I was until recently enrolled at Dr. Geisler's school to study apologetics and philosophy. This year I decided in order to be fair and honest to read all the top skeptical books on religion. So I did some research and made a list of over 100 books. I am now at book 76 and consider myself a confident Atheist. If your faith can withstand our arguments then you will be a better informed Christian with a much stronger faith. If your faith cannot withstand our arguments then your faith wasn’t worth having in the first place. YOU HAVE NOTHING TO LOSE! But you have everything to lose. Should I intentionally surround myself with as many ravenous wolves as I can find; if I survive I am stronger for it, and if I get torn to pieces...? Like all men their reasoning is fallen, but they are also susceptible to lies. They have a disposition towards believing falsehood in preference truth. If the Bible is true then those who write against the Bible are likely to be writing rhetoric for nonsense. What benefit is it for those who know the truth to spend so much time listening to error? In the second letter to the Corinthians Paul gives some advice on giving money. He makes a comment which, while applying to money in the context, seems to have broader application. Here was something (giving) which the Corinthians started to do. Not only did they begin to do this work, they desired to do it. Further, Paul says that the desire needs to be matched by finishing the work. It is not enough to have a keen desire, the desire must both be acted on and completed. This corresponds to Jesus' parable about the 2 sons. Monopolists, apparently, can conceive of only one way of making money, which is bullying consumers and competitors to put up and shut up. Furthermore, it also appears to mean that past mistakes have to be repeated at a larger, and ever more ridiculous, scale. Michele Boldrine and David K Levine, Against Intellectual Monopoly. It is not uncommon to hear that money is the root of all evil. While having money is associated with temptations that are less common for the poor, the misquote places the source of the evil in the an amoral object, or rather the possessor of the object. It implies that having money is reflective of an evil heart. When read right, that the love of money is a source of evils, we avoid this error. By seeing that covetousness is the problem we see that the desire to obtain money causes a great many evils, and it can be a temptation to all men, not just the wealthy. While a true statement and in line with what I am arguing, it is not warranted in a literal translation. We can see that not every evil has its source in the love of money. Consider the sin of Adam and Eve. This passage should be read proverbially. The context concerns false teachers, the necessity of contentment, and those who long to be rich. Those who desire to be rich fall into temptation, into a snare, into many senseless and harmful desires that plunge people into ruin and destruction. For the love of money is a root of all evils. Paul's phrase does not require one to think that every evil ever seen is motivated by money, it merely is a proverbial type statement directed at people who want to be rich: showing them that this desire will lead them into many evils. Paying close attention to both what exactly the passage does say (love of money) and the genre and context (people longing to be rich) helps the reader understand what Paul is saying here. Covetousness, especially coveting money, will lead men into all manner of wickedness.